Today is the day. 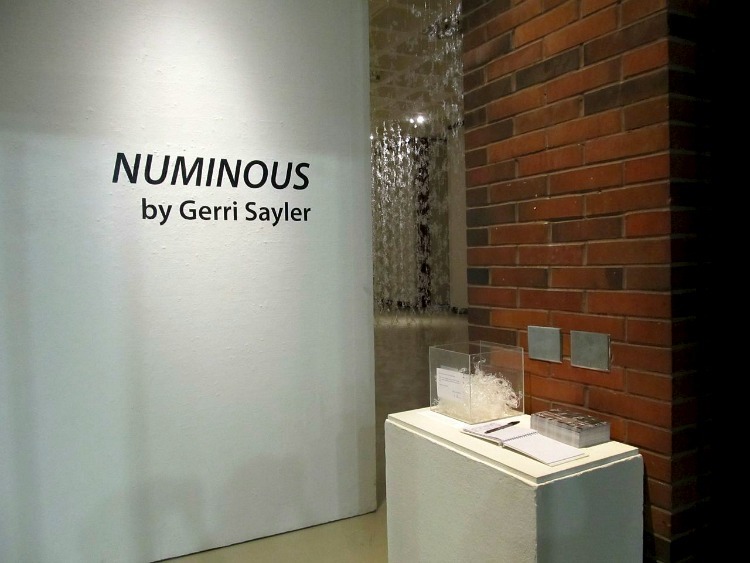 In eight hours, I will stand at a podium speaking from my heart about Numinous. Do I tell the audience about my 11th hour epiphany? I thought my installation was done late yesterday afternoon. Until I about to leave the gallery. That’s when I realized the lighting was wrong. Unlike my previous venues, the Spurgeon Art Gallery has no natural lighting. To juice things up, I had borrowed high-intensity stage lights from the theatre department. The space lit up like a house of glass on steroids. Seductive yes … contemplative not so much. I asked a few people from the art department for advice on scaling back on lighting. Turns out, the low-level LED spots were perfect. We even turned off a few. We also heave-hoed a moveable wall to screen the hallway, which diminished spill-over lighting from the hallway. Wrapped for privacy in this way, the installation became far more conducive to a contemplative experience. That idea was a gift from Brian Kooser. Renowned in the Northwest for his puppetry, he recently returned to school as a CWU graduate student. His sculpture is astonishing. Ultimately, he’d like to teach sculpture at a university, and integrate Puppetry into the curriculum as contemporary art form. Off to my favorite coffee shop to work on notes for my artist talk!